Android Marshmallow has lot of different features for you Android phone. There is one of the most interesting and useful feature is to quickly select your default Apps in Android 6 Marshmallow. You can easily select required default Apps for browsing, sending or receiving emails and other purpose. Android 6.0 Marshmallow allows you to easily manage your default apps as per your requirement. Previous version of Android provide the opportunity to choice what you want to open relevant apps for first time on your phone. But if you try to switch your default app with new one then you have to face problem. Now, you can quickly select your default Apps in Android 6.0 Marshmallow for browsing purpose. Normally we have single default app on our Android phone. But if you install another app on your Android phone then you have to know how to handle them. For eg. If you already installed Google Chrome browsing app on your Android phone and you want to install Firefox or Opera also in your phone. Now, next time when you tap on any web link it will ask you which browser you have to use and you have to tap “Just Once” or “Always” option. Just Once allows to open the active web link for current time but if your choose Always then it will be the default app on your Android phone. 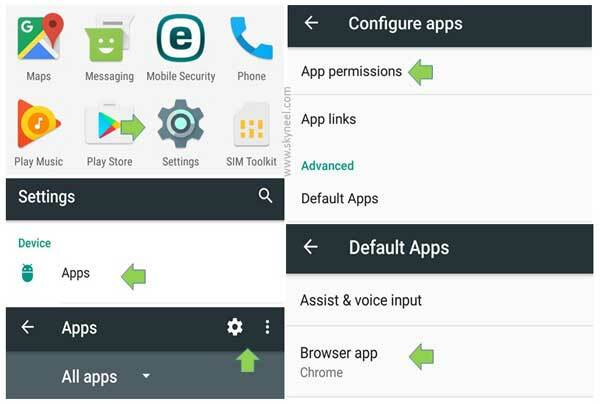 Now, if you want to quickly select your default Apps in Android 6 Marshmallow then you have to take few simple steps. Step 1: Tap on the “Settings” option on your Android 6.0 Marshmallow. Now, tap on the “Apps” option on your Android phone. Step 2:Tap on the three vertical dots icon which is located on the top right corner in Apps window. Sometime you have to tap on the Gear icon. Now, tap on the “Default Apps” option in the “Configure apps” window. Step 3: By default there is no default browser shown when you start this process first time. But if you already have more than one browser app then tap on the Browser app and select the default browser app which you want to replace with another one. Now, this is your default browsing app when you launch or open a new web link it automatically open in your default app. I hope after reading all the steps you can quickly select your default Apps in Android 6 Marshmallow on your phone. If you have any suggestion or query regarding this guide please write us in the comment box. Thanks to all.